Liver-specific deletion of Pten and Sav1 accelerates the development of fatty liver and tumorigenesis. (A) Livers from 5-month-old mice of the indicated genotypes. 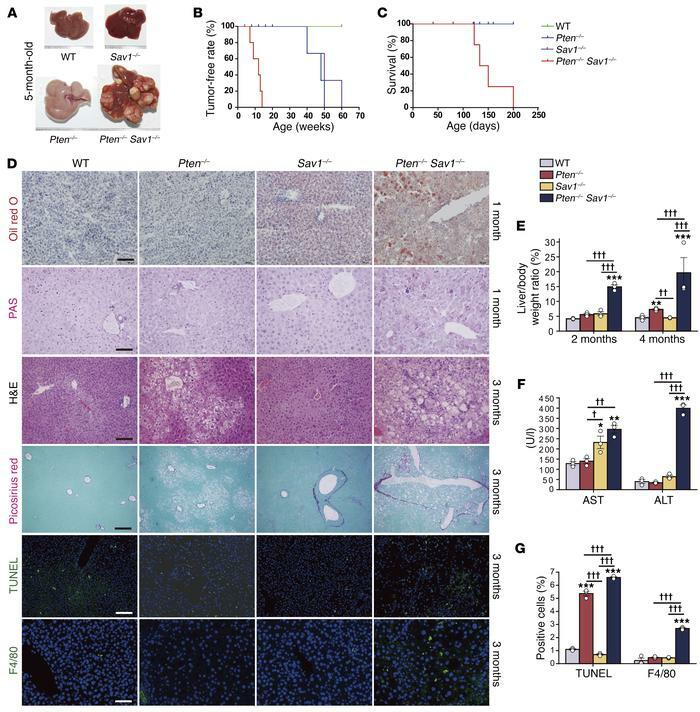 DKO (Pten–/– Sav1–/–) livers show advanced tumor development. (B and C) Tumor-free rate (B) and survival rate (C) for mice of the indicated genotypes. (D) Oil red O and PAS staining of livers from 1-month-old mice as well as H&E, Picrosirius red, TUNEL, and F4/80 staining of livers from 3-month-old mice. Scale bars: 100 μm (Oil red O, H&E, and F4/80), 50 μm (PAS), and 200 μm (Picrosirius red and TUNEL). (E) Liver-to-body weight ratio for mice at 2 and 4 months of age. (F) Liver enzymes (aspartate aminotransferase [AST] and alanine aminotransferase [ALT]) in the serum of 3-month-old mice of the indicated genotypes. (G) Quantification of apoptotic cells and macrophages following (D) TUNEL and F4/80 staining. Nuclei were stained with DAPI (blue fluorescence). Data represent the mean ± SEM. *P < 0.05, **P < 0.01, and ***P < 0.001 versus WT; †P < 0.05, ††P < 0.01, and †††P < 0.001 for the indicated comparisons (1-way ANOVA). (A–G) n = 5 WT mice; (A) n = 5 mice, (B–D) n = 8 mice, and (E–G) n = 3 mice of the other 3 genotypes.